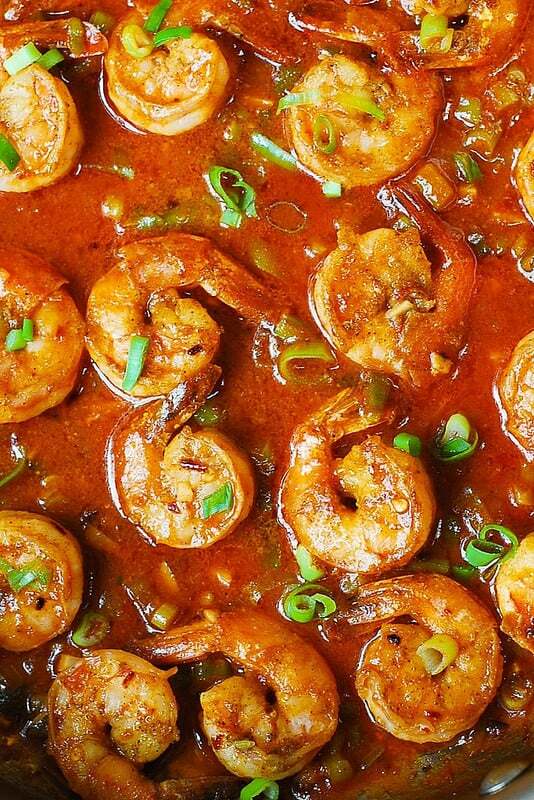 I love Cajun spice, and not surprisingly it goes really well with shrimp! Try this recipe, and you’ll see what I mean! I couldn’t stop eating it! I wanted a simple spicy Cajun-style shrimp dinner that I could make with just a few basic ingredients. This recipe worked really well, and all 25 jumbo shrimp were devoured within 20 minutes by 3 people (including me). It’s amazing how fast the food can disappear from the table if it tastes good! Use jumbo shrimp, about 20-25 count. The shrimp should peeled, deveined, but still with tails on. Use store-bought Cajun spice. 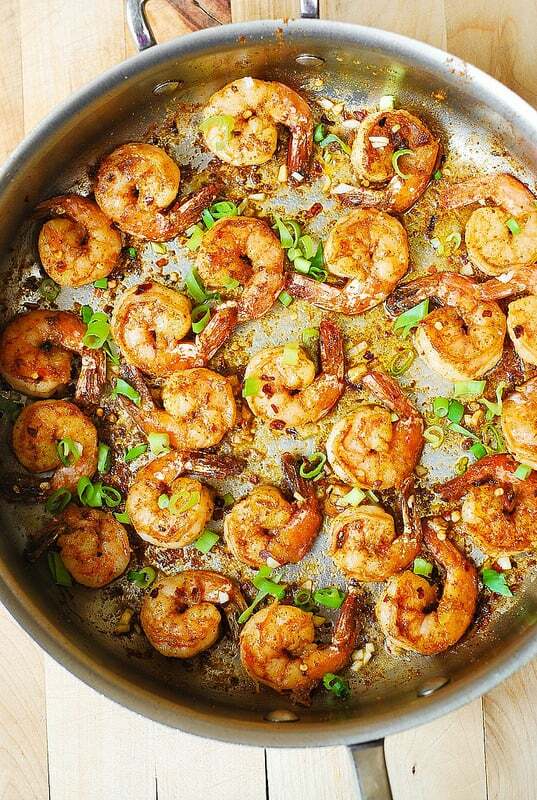 If your Cajun spice already contained salt, you do not need to add salt to your shrimp. But if your Cajun mix is without salt, add a pinch of salt, to your shrimp. For hot sauce, use hot cayenne sauce, such as Frank’s hot sauce. In a small bowl, toss shrimp together with minced garlic, and Cajun spice and a pinch of salt (see recipe note above). Melt butter in a large skillet on medium-hot heat. Add shrimp (mixed with garlic and Cajun spice) to the skillet and cook for about 1 minute on each side, flipping once. 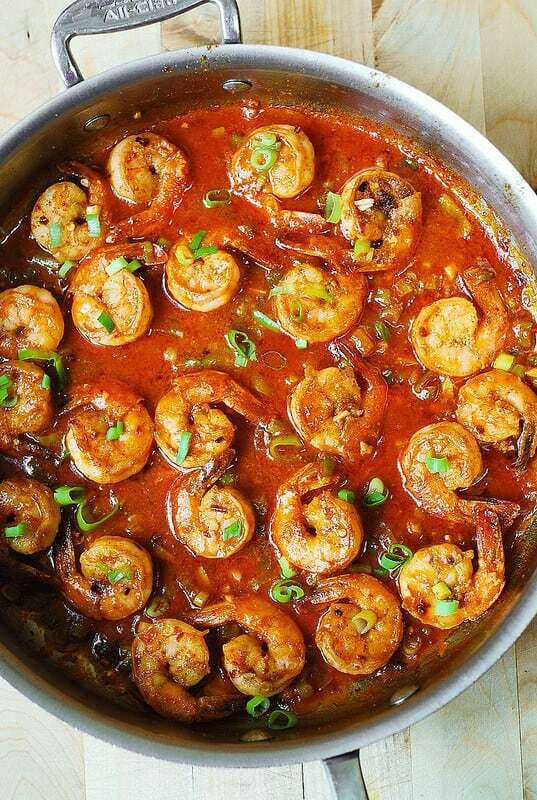 Remove the shrimp from the skillet onto a plate. Add chicken broth, ketchup, chopped green onions, hot sauce to the same skillet. Bring everything to boil and mix well. Add back the shrimp, boil or simmer for a couple of minutes until the shrimp is cooked through and the sauce thickens, constantly stirring. If sauce is too thick, add a small amount of water. Serve topped with chopped green onions. If you’re in a hurry, and want an easy flavorful and spicy Cajun shrimp – this is the recipe for you! Southern comfort food! 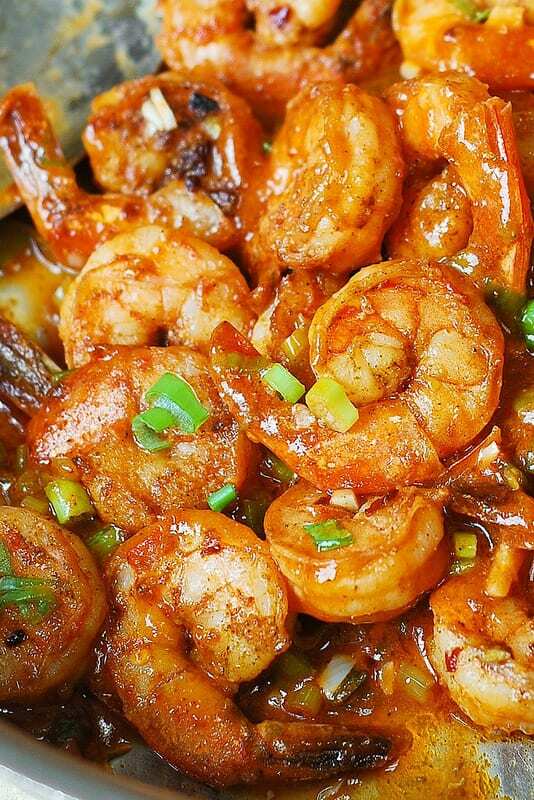 Spicy Cajun Shrimp with lots of sauce - delicious Southern dinner or appetizer! Made with garlic, ketchup, chicken broth, hot sauce, Cajun spice, and green onions. Super easy to make - 30 minutes from start to finish! In a small bowl, toss shrimp together with minced garlic, and cajun spice (my Cajun spice already contained salt, so no salt needed to be added, but if your mix is without salt, add a pinch of salt, too). 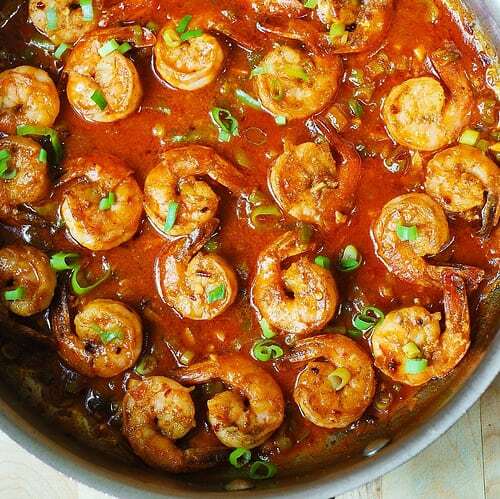 Remove shrimp from the skillet onto a plate. Add chicken broth, ketchup, chopped green onions, hot sauce to the same skillet, bring to boil, mix everything well. Add back the shrimp, boil or simmer for a couple of minutes until shrimp cooks and sauce thickens, constantly stirring. If sauce is too thick, add a small amount of water. To serve, top with green onions. May I suggest using Heintz chili sauce in the bottle in place of ketchup. It puts a little different dimension to the dish. Great, simple recipe!!! I am so glad you liked this recipe! Thank you for your suggestion! Oh my God! This was beyond unbelievable! I tweaked it just a bit. First of all, I doubled the recipe. For my sauce, I used a combination of chicken broth and white wine/ketchup/onions and hot sauce. I served the result over thick spaghetti. Julia, I cannot TELL you how much I LOVED this! I have to go and coach Women’s Semi-Professional Football. If I didn’t? I think I’d FINISH it! I look forward to following you! Thanks for bringing some warmth to a Cold Minnesota evening. Thank you for such a wonderful comment! It made my day! So happy you liked this shrimp. Serving it over spaghetti is such a great idea!